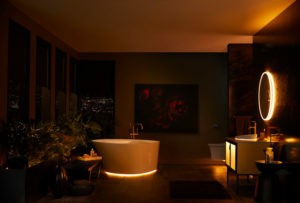 Share the post "Kohler’s new gadgets will make you never want to leave your bathroom again"
Welcome to 2019, where technology development is already moving full steam ahead. We have already faced self-driving cars, drones delivering the goods to our doors or Amazon’s voice assistant Alexa, which takes care of many everyday tasks and makes our life so much easier. The humankind, however, is characterized by the fact that it never ceases in search for further paths of development, improvement, innovative solutions and thus – ways to make money. Let’s just look at how our lives looked even 20 years ago, and now. A tremendous change, isn’t it? A perfect example of this phenomenon is a company Kohler which brings you bathroom you didn’t even know you dreamt about. Their new collection called The Veil Lighted introduces a new line of high-tech products which will allow you, among other things, for voice management of various functions, such as lighting’s color temperature, the amount of water in the tub or even the heating of the toilet seat. You can control it either by voice, the Kohler Konnect app which works both for iOS and Android devices, with motion control or with a physical remote controller. What is more, the customers are capable of interacting with multiple voice services like Alexa, Google Assistant or Siri. Kohler is globally known for creating various solutions for kitchens and bathrooms, however only recently combines it with the smart section, which was finally given a separate name – “Kohler Konnect”. The company first made its debut at last year’s CES, where they presented a line of smart showers, toilet bowls, but most importantly – smart mirrors called Kohler Verdera Voice Mirror (connected with Alexa). This year they have improved their offer by synchronization and customization the lighting accenting the fixture. The are many lighting and audio enhancements which allow individual adjustment of lighting depending on the mood or time of day, as well as built-in speakers and sensors. This is due to a collaboration with Signify, once known as Philips Lighting, one of the leading connected lighting companies. All it takes is to give a command – to activate the light, to release water in the shower (also indicate the amount of water to the bathtub) or even to order our “throne” to warm up! A truly intelligent bathroom! The Konnect platform is also to automate many tasks, including monitoring water consumption and also to allow for building cooperation with other smart modules. Can you imagine leaving the bathroom with the command: “Alexa, flush the toilet”? Excessive luxury or new reality? Suppose your answer is the latter, this new reality will cost you a lot of money. Prices start from $899 for a mirror and go to $7,000 for the Numi 2.0 toilet. It is no secret that such luxurious gadgets cost a fortune. What is my opinion about this new intelligent bathroom? It is a common knowledge that humanity is moving forward in every aspect of life and innovations are now appearing at every step. Currently, these are just introductions to the future solutions, unavailable to the average person, however, what once seemed impossible, is slowly becoming an indispensable element of our lives. This was the case with smartphones or many other gadgets, currently satisfying our most basic needs. I believe that the innovations introduced by Kohler in the near future will also cease to be something extraordinary and will turn into an element available in every home. The most important thing is that the man still surprises himself, introduces technologies that seem not from this planet and really becomes the only obstacle to himself. The Veil Lighted collection introduced by Kohler will be available from this year, and I personally look forward to what will bring us the future. That’s very interesting but to be honest do we really need such things? We should distinguish between what do we really need, what would be helpful for us and what is just an extra gadget. But where are the boundaries and when do we cross them? I think that this fine line will go further every year and that’s really worrying. It should be at least. If we have options like heated toiled controlled by our voice NOW, what will future look like? Will we become completely lazy and replace every even smallest effort by robots and AI? I like Kolher’s ideas very much. It may seem unnecessary at first, but let’s think about intelligent cars, intelligent kitchen appliances and so on. Why shouldn’t we improve our bathrooms too? For example, asian market has already introduced plenty of high-tech toilets and they gained tremendous popularity. I am an advocate of every gadget that simply makes our everyday life easier. I personally would like to activate light in my bathroom by command and I am glad that Kohler is keeping up with the technology around.